The Britax B-Ready 2017 edition is both a single or an inline tandem stroller and can be used in 12 different seating configurations. Two seats, two car seats, a bassinet, you can mix and match and face them just the way you like. 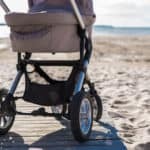 This is a smart stroller to buy when you’ve just got one child and are planning another because you won’t have to buy a double stroller later on! As a single, the B-Ready can take a 55-pound weight limit and the second seat on the doubles kit can take a 35-pound weight limit. You will love that the 2nd seat fully reclines AND you can fold the stroller with BOTH SEATS attached. Features like the height adjustable handle bar and ample storage basket beneath the seat are big positives with parents. As you browse through this article, you will have a thorough understanding of what this modern and stylish stroller has to offer and why parents are giving it rave reviews. Let’s first begin with all the fabulous features. 5 Tell me about the seating configurations. 7 What’s the handling like? 10 What is the fold like? 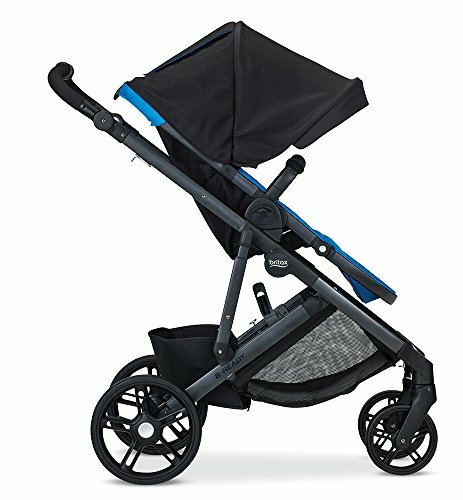 14 Where can I buy the Britax B-Ready stroller? 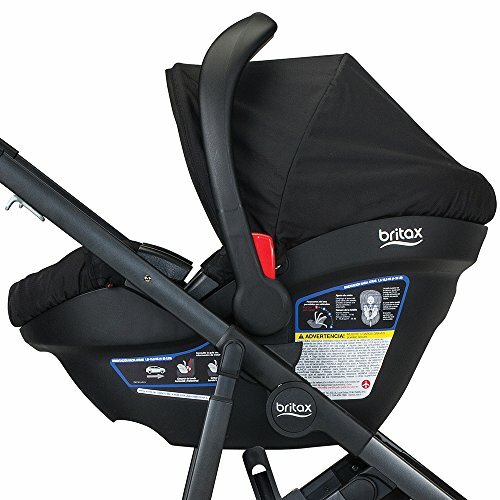 Let’s start with the 2017 Britax B-Ready seat. Like many luxury strollers, the B-Ready has a molded seat, meaning that when it reclines, the seat back does not angle independently of the seat – the entire seat moves. Your baby should be at least 6 months old to ride with the main seat. However, you can use a car seat until baby is old enough, and the 2017 B-Ready has a Click & Go System, allowing for a quick connection with any Britax infant car seat or bassinet. As a single, the stroller can take a 55-pound weight limit and the second seat on the doubles kit accommodates 35 pounds. Several parents mention in their reviews that the main seat in the B-Ready sits up higher than other brands, and they like that. While a snack tray doesn’t come with this Britax stroller, it does have a padded bumper bar that swings away for easy in and out. You could buy the snack tray separately if you want – the low star rating at the time of writing was due to it being a mismatch with older B-Ready models. This one is specific to the 2017 B-Ready. The seat has four total positions and I absolutely love the one-handed lever recline feature. It’s nice and smooth so you leave your child undisturbed while napping. I noticed an indicator next to the seat with an arrow pointing to which recline position the seat is in. That takes out the guesswork because sometimes it’s hard to tell which position the seat is in. I love the optional second seat and its 4-position recline! What do you think of that? Not many inline double strollers offer a flat recline! The second seat has all the features as the main seat such as the full-coverage canopy, ventilation window, and adjustable 5-point safety harness. 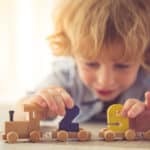 Re-threading the harness as your child grows taller can be a hassle. Wouldn’t you agree? Well, the Britax B-Ready uses a system where you unzip the back of the seat and slide an adjuster up and down to the height you need and it adjusts both the straps and the head rest at the same time. Even better you can further adjust the straps in front to get the fit just right. I’ve never seen an easier adjustable harness! The precision fit provides better comfort for your child and peace of mind about safety for you. To round off the main seat, an adjustable footrest adds leg support. In a positive review, a mom said that her daughter slept comfortably in the seat with the leg rest up and seat back and woke up without being cranky. Tell me about the seating configurations. The 2017 Britax B-Ready stroller is a highly versatile stroller because parents can choose to mix and match different types of seats into 12 different combinations. The front seat goes either forward or parent-facing This is the most basic combination where you won’t need to purchase any more accessories. Then you have the option to buy the second rumble seat that fits over the storage basket, turning your Britax B-Ready into an inline tandem stroller. While this second seat is not reversible, it is roomy and reclines, as described above in the seat section. The only negative I experienced when I tested this stroller is that my thighs would bump up against the rumble seat while pushing it. I’m 5’7″ so your stride may be different. The B-Ready accommodates one or two car seats that you will have to get separately. To use a second car seat, you will need to buy the lower infant car seat adapter. You also have the option of using the very attractive bassinet with your B-Ready. The bassinet comes in matching colors to your stroller and it looks absolutely gorgeous, don’t you think? Now you can only use the bassinet on the top and you can use only one, not two, as you can see from the compilation of photos. Another feature I like are the rear wheel coverings that provide extra protection against little fingers going near them when the rumble seat is in place. And you install them when you need them – in singles mode, you might just want the plain wheels without the covers. This is a big stroller, very sturdy with a nice thick, quality frame, but it turns on a dime and can easily maneuver one-handed, thanks to a newly added rubber gripper in the center of the handle on the 2017 edition. The stroller has an all-wheel suspension that provides smooth rides. When I tested the B-Ready, it performed beautifully and was a sheer joy to use. A mom mentioned in her review that she recently brought her children to a local carnival, and her twin boys love riding in the Britax B-Ready. She loves that the stroller pushes like a dream, and it is almost effortless to maneuver. While it may not push one-handed in doubles-mode because of the added weight of the second seat and rider, it still maneuvers quite well. The front swivel wheels can lock into place for going over slightly rougher surfaces. Bella from Jacksonville, Florida says her B-Ready does great over dirt roads, grass and paved sidewalks. Just keep in mind that this is not an all-terrain stroller – but it will take you over “playground terrain” quite well. This 2017 Britax stroller turns on a dime, though and can easily be steered one-handed when used as a single because there is a new rubberized middle section on the handle making it quite simple. It is easier to steer if your heavier child is in the main seat because the higher weight maintains the center of gravity. Both rear wheels of the stroller are equipped with brakes that are linked together and the brakes lock with just one step. I like this feature because it is the same motion to lock and unlock. It’s the perfect solution for us moms who like to wear flip flops. The color indicator is also unique: red when the brakes are engaged and green when disengaged. 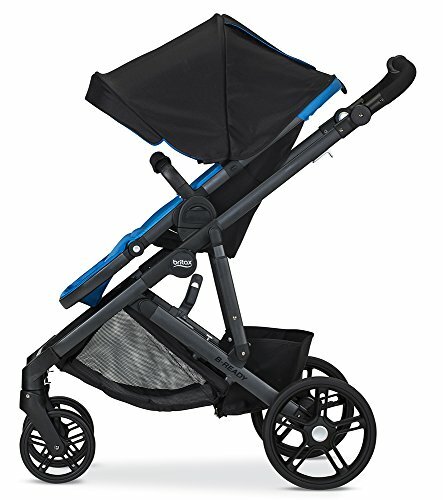 A large sun canopy is one of the most important criteria of a good stroller on every mom’s list. I like the hood on the B-Ready for a number of reasons. Besides being nice and big, the canopy has a ventilated peek-a-boo window that keeps your baby cool and comfortable during a summer stroll. I also appreciate the magnetic corners that secure the window flap down – no more Velcro rip to wake your baby when you want to check in. Next, a pop-out sun visor provides additional protection. Additionally, the Britax B-Ready stroller includes a rain cover accessory that fits into one of the two pockets at the back of the seat. This stroller requires two hands to fold and the seat needs to be in the upright position. Pulling up on two triggers on either side of the frame folds it right down and a chassis lock holds the frame in place. Once folded it can stand alone, but you will see it is bulky! But it is a full-sized luxury stroller, which are known for taking up a good amount of space. And guess what? It can fold with the second seat! I found it very convenient that I didn’t need to remove the seats the 2017 Britax B-Ready. The Britax B-Ready stroller comes with a large underseat storage basket that is accessible from all sides. What I love about this basket is that you can unzip the front and get your things when the doubles seat is used and your 2nd child’s feet and legs rest in the basket. Even with your second child’s feet in the basket, you still have ample room. There’s an additional storage pocket behind the main seat. Tall parents will enjoy maneuvering the stroller more, since it comes with an adjustable handle. 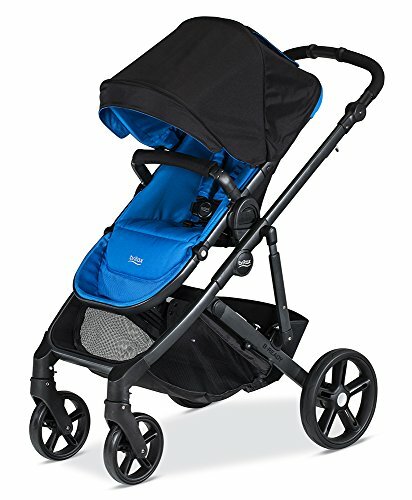 Many satisfied tall dads have complimented the feature as the adjustable handle helps tall parents push the stroller comfortably, and keeps them walking in a proper posture. Here’s a video review/demo of the 2017 Britax B-Ready in singles mode. This remarkable stroller has been receiving rave reviews both from parents and from consumer ratings professionals. Moms and Dads just like you have been giving the 2017 Britax B-Ready fairly high reviews across different web retailers online! Consumer Reports has something to say as well. The B-Ready is a Recommended Buy with an overall great score. It has Very Good marks for ease of use and Excellent marks for Maneuverability and safety. The stroller receives the same kudos from the pros as you will read below. By far the most reviews rave about the fact that this single stroller can turn into a double and it doesn’t feel cumbersome. It also has very good balance and stability: Your child can climb in and out of the double seat in the back and the stroller will not tip over. This amazing convertible stroller is also comfortable for your child or children. Many reviewers compliment the magnetic closure of the peek-a-boo window flap, favoring it over a ripping Velcro. Despite all the wonderful benefits and features that go with the Britax B-Ready stroller, it comes up a bit short with regard to heavy weight. Once the second seat is added, this stroller is heavy! This was the main disadvantage Consumer Reports quoted on as well. To help with the weight hauling it in and out of your car, you might consider detaching the seats to lighten the load. A few parents are disappointed that a cup holder is not included. 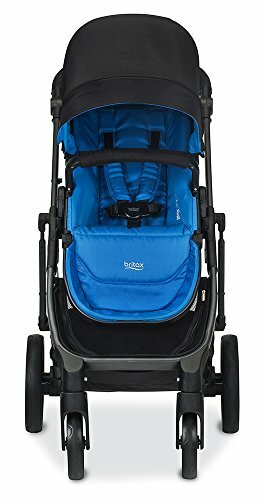 Where can I buy the Britax B-Ready stroller? 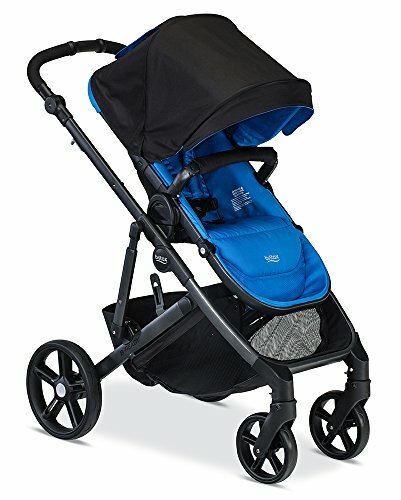 As with all the strollers reviewed on Stroller Envy, I like to keep a check on the prices and so far the best online retailer I’ve seen selling the B-Ready is on Amazon. Get the latest model B-Ready for a great deal, with 5 colors available! Imagine how phenomenal you’re going to feel pushing this beauty around YOUR neighborhood!